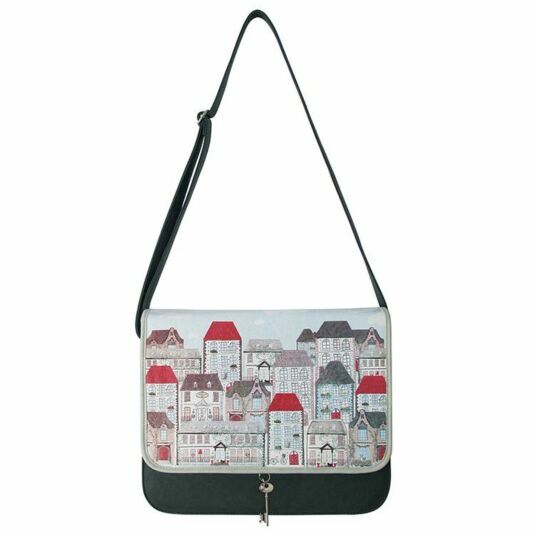 This beautiful leather look satchel bag from the Disaster Designs ‘Home’ range features a quirky design of rows of tall houses. 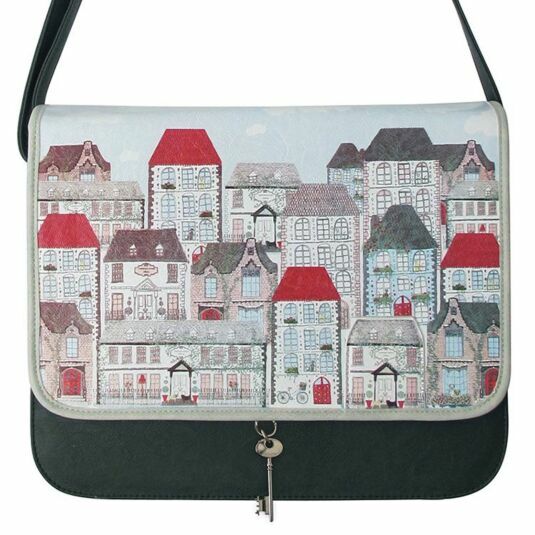 The hand drawn image is intricately detailed and covers the front flap of the satchel; tall houses with lots of windows and tiled rooves and wisteria growing up the front of them. Look more closely and tiny details can be seen, a bicycle parked against the front of one house, a cat looking from the window of another. The image has a lot of delightful detail and is coloured in soft red, grey and pale blue. The body of the satchel is a deep dusky grey, with a soft patina mimicking real leather, although this is a cruelty free faux version. Lift the front flap and you will find a handy pocket for tickets and items you need to find quickly, which is shaped like a double fronted period house, illustrated with iron railings, two pugs and a name plaque above the front door. The front flap is secured by two sturdy magnetic press studs and includes the amusing detail of a metal key attached to a faux leather tab, a lovely detail which fits in with the home theme. The interior of the bag is lined with a monochromatic black and white geometric patterned fabric, and there are three further pockets inside, one zipped, one for a mobile phone, one for other itmes. 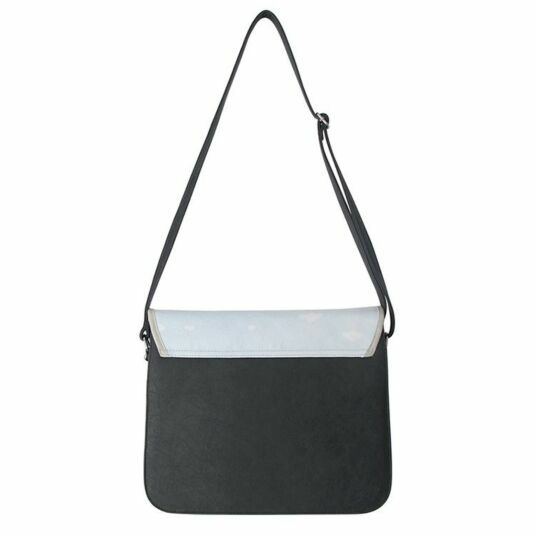 An extendable shoulder strap in matching soft grey completes the design. “HOME (noun) Somewhere to find: tea & biscuits, messy kitchens, muddy paw prints & cosy bubble baths. This is a lovely bag which will work all year round. It could be a perfect office bag, with room for a laptop, a school bag for children or just a handbag which is a little different! It makes a beautiful gift for birthdays, Mother’s Day or Christmas. 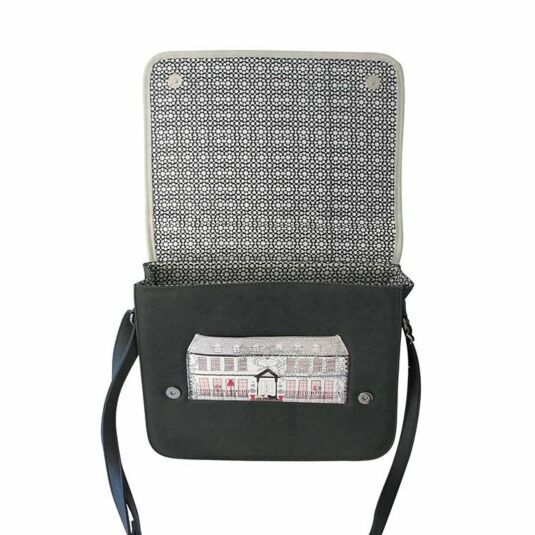 A beautiful range of bags and wallets from Disaster Design Home range which features very detailed hand drawn houses in different designs. This delightful range will not only make a statement but is guaranteed to create a smile, the perfect gift for both adults and older children.